The Neon Rocket 24v Ultimate Kids Electric Scooter is finally here and is set to be the most wanted gift this Christmas. This is the very latest in kids electric scooters and comes with a brand new rear flashing feature. Featuring a twist throttle, this amazing scooter has a powerful 24v motor and is capable of reaching speeds up to 12km per hour, making this one of the fastest scooters out there, especially for this amazing price. This stunning kids scooter comes with an extended the battery life and performance. 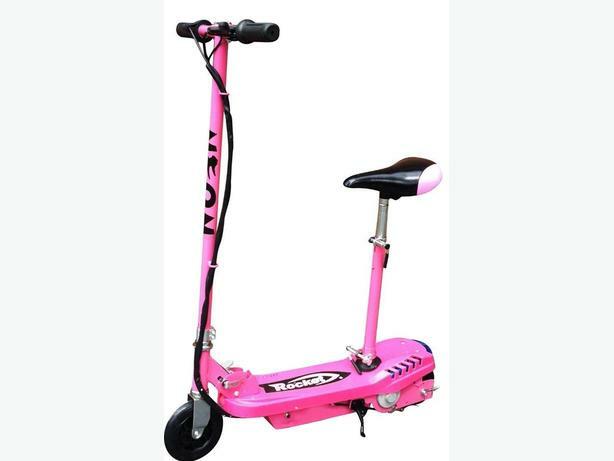 Choose from a range of neon colours or get a different colour for each of your kids and let the electric scooter races begin. The Neon Rocket 24v Ultimate Kids Electric Scooter recharges in approximately 3 hours and has a range of 10-15 kilometres. With an extra responsive front drum brake (operated via a front hand lever) you won't need to worry about the speed getting out of hand. Extra thick rubber wheels provide an exceptionally smooth and quiet ride and the main body folds down quickly for transportation. The Scooter is fully height adjustable and with a maximum rider weight of 60kg, this is a versatile and incredibly fun way for your kids to get around.